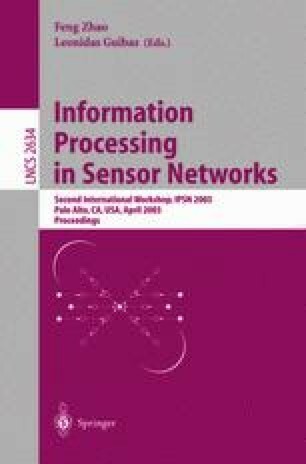 Sensor networks have emerged as a fundamentally new tool for monitoring spatially distributed phenomena. This paper investigates a strategy by which sensor nodes detect and estimate non-localized phenomena such as “boundaries” and “edges” (e.g., temperature gradients, variations in illumination or contamination levels). A general class of boundaries, with mild regularity assumptions, is considered, and theoretical bounds on the achievable performance of sensor network based boundary estimation are established. A hierarchical boundary estimation algorithm is proposed that achieves a near-optimal balance between mean-squared error and energy consumption. Supported by the National Science Foundation, grant nos. MIP-9701692 and ANI-0099148, the Office of Naval Research, grant no. N00014-00-1-0390, and the Army Research Office, grant no. DAAD19-99-1-0290. Supported by the Texas Instruments Visiting Professorship. K. Chintalapudi and R. Govindan. Localized edge detection in sensor fields. University of Southern California, Computer Science Department, Technical Report, 02-773, 2002. available at http://www.cs.usc.edu/tech-reports/technical-reports.html. E. Kolaczyk and R. Nowak. Multiscale likelihood analysis and complexity penalized estimation. Annals of Statistics (tentatively accepted for publication). Also available at http://www.ece.rice.edu/~nowak/pubs.html, 2002.